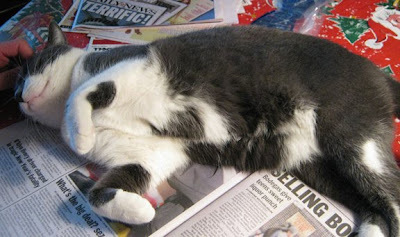 Many of you have asked if I like to have my tummy rubbed. The answer is an emphatic NO. Anyone who tries to rub me there will lose one or two fingers. Perhaps the entire hand will wind up scratched and bitten. In fact, I don't even roll over on my back with the tummy in the air. So here, dear furrends, are some pictures of the elegant markings on my tummy that neither man nor beast have ever seen before. TW says the markings look like I'm wearing a bikini. 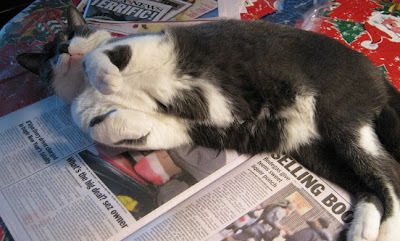 I do, however, love to roll over on the newspaper while Pop is trying to read. But, then again, what cat doesn't. You do look like you're wearing a bikini! Hot stuff, CK! They are rather enticing, that's why people wanna rub your belly I suppose. You are such a pretty girl.